The book covers all statistical methods (and many more) used in our ConsumerCheck software as well as our PanelCheck software that has been available since 2005. Both ConsumerCheck and PanelCheck are free to use and open source and our book is the perfect companion for users that wish to understand the statistical methods used in the software. 1.1 The Distinction between Trained Sensory Panels and Consumer Panels. 1.2 The Need for Statistics in Experimental Planning and Analysis. 1.3 Scales and Data Types. 1.4 Organisation of the Book. 2 Important Data Collection Techniques for Sensory and Consumer Studies. 3 Quality Control of Sensory Profile Data. 3.2 Visual Inspection of Raw Data. 3.3 Mixed Model ANOVA for Assessing the Importance of the Sensory Attributes. 3.4 Overall Assessment of Assessor Differences Using All Variables Simultaneously. 3.5 Methods for Detecting Differences in Use of the Scale. 3.6 Comparing the Assessors’ Ability to Detect Differences between the Products. 3.7 Relations between Individual Assessor Ratings and the Panel Average. 3.8 Individual Line Plots for Detailed Inspection of Assessors. 4 Correction Methods and Other Remedies for Improving Sensory Profile Data. 4.2 Correcting for Different Use of the Scale. 4.3 Computing Improved Panel Averages. 4.4 Pre-processing of Data for Three-Way Analysis. 5 Detecting and Studying Sensory Differences and Similarities between Products. 5.2 Analysing Sensory Profile Data: Univariate Case. 5.3 Analysing Sensory Profile Data: Multivariate Case. 6 Relating Sensory Data to Other Measurements. 6.2 Estimating Relations between Consensus Profiles and External Data. 6.3 Estimating Relations between Individual Sensory Profiles and External Data. 7 Discrimination and Similarity Testing. 7.2 Analysis of Data from Basic Sensory Discrimination Tests. 7.3 Examples of Basic Discrimination Testing. 7.4 Power Calculations in Discrimination Tests. 7.5 Thurstonian Modelling: What Is It Really? 7.6 Similarity versus Difference Testing. 7.7 Replications: What to Do? 7.8 Designed Experiments, Extended Analysis and Other Test Protocols. 8 Investigating Important Factors Influencing Food Acceptance and Choice. 8.2 Preliminary Analysis of Consumer Data Sets (Raw Data Overview). 8.3 Experimental Designs for Rating Based Consumer Studies. 8.4 Analysis of Categorical Effect Variables. 8.5 Incorporating Additional Information about Consumers. 8.6 Modelling of Factors as Continuous Variables. 8.7 Reliability/Validity Testing for Rating Based Methods. 8.9 Choice Based Conjoint Analysis. 9 Preference Mapping for Understanding Relations between Sensory Product Attributes and Consumer Acceptance. 9.2 External and Internal Preference Mapping. 9.3 Examples of Linear Preference Mapping. 9.4 Ideal Point Preference Mapping. 9.5 Selecting Samples for Preference Mapping. 9.6 Incorporating Additional Consumer Attributes. 9.7 Combining Preference Mapping with Additional Information about the Samples. 10 Segmentation of Consumer Data. 10.2 Segmentation of Rating Data. 10.3 Relating Segments to Consumer Attributes. 11.1 Basic Concepts and Principles. 11.2 Histogram, Frequency and Probability. 11.3 Some Basic Properties of a Distribution (Mean, Variance and Standard Deviation). 11.4 Hypothesis Testing and Confidence Intervals for the Mean μ. 11.6 Relationships between Two or More Variables. 11.8 Binomial Distribution and Tests. 11.9 Contingency Tables and Homogeneity Testing. 12 Design of Experiments for Sensory and Consumer Data. 12.2 Important Concepts and Distinctions. 12.4 Fractional Factorial Designs: Screening Designs. 12.5 Randomised Blocks and Incomplete Block Designs. 12.6 Split-Plot and Nested Designs. 13 ANOVA for Sensory and Consumer Data. 13.3 Single Replicate Two-Way ANOVA. 13.4 Two-Way ANOVA with Randomised Replications. 13.6 ANOVA for Fractional Factorial Designs. 13.7 Fixed and Random Effects in ANOVA: Mixed Models. 13.8 Nested and Split-Plot Models. 14.1 Interpretation of Complex Data Sets by PCA. 14.2 Data Structures for the PCA. 14.3 PCA: Description of the Method. 14.4 Projections and Linear Combinations. 14.5 The Scores and Loadings Plots. 14.8 Calculations and Missing Values. 14.12 The Relation between PCA and Factor Analysis (FA). 15 Multiple Regression, Principal Components Regression and Partial Least Squares Regression. 15.3 The Relation between ANOVA and Regression Analysis. 15.4 Linear Regression Used for Estimating Polynomial Models. 15.5 Combining Continuous and Categorical Variables. 15.6 Variable Selection for Multiple Linear Regression. 15.7 Principal Components Regression (PCR). 15.8 Partial Least Squares (PLS) Regression. 15.9 Model Validation: Prediction Performance. 15.10 Model Diagnostics and Outlier Detection. 15.12 Generalised Linear Models, Logistic Regression and Multinomial Regression. 16 Cluster Analysis: Unsupervised Classification. 16.4 Cluster Analysis for Matrices. 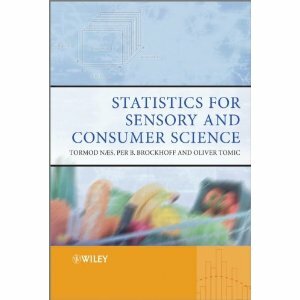 17.1 Three-Way Analysis of Sensory Data. 17.2 Relating Three-Way Data to Two-Way Data.